CK Sheer Beauty Essence is a new fragrance designed for the younger generation. 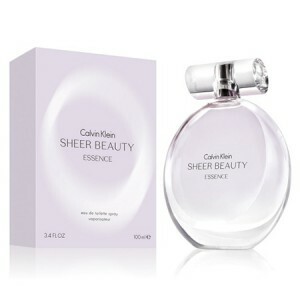 CK Sheer Beauty Essence 100ml. Eau De Toilette - Spring 2013 Calvin Klein presents Sheer Beauty Essence, a new version of the flower perfume Sheer Beauty 2012. Sheer Beauty Essence - elegant, feminine, light, bright and elegant fragrance with floral and musky undertones. Top notes include pear flower and juicy white peach. Rich floral bouquet begins in the heart with notes of lilac, peony, magnolia and Turkish rose. Air musk, vanilla and cedar form the basis of the perfume. It is a new fragrance composition is designed for the younger generation. Perfume for gentle, dreamy girls, which emphasizes their refinement and elegance. Owners of the new fragrance will feel more feminine and will catch yourself admiring male glances. Top notes: pear, peach, peony, magnolia, rose, lilac, vanilla, cedar and musk. The fashion house Calvin Klein introduced another scent that continued the theme of women's perfume Beauty. Novelty called Sheer Beauty Essence and ninety-third will be on the account fragrance brand. Owners of the new fragrance Calvin Klein Sheer Beauty Essence will feel more feminine and will catch yourself admiring male glances. Top notes of perfume creation seamlessly blends sensual chords flowers Asian pears and our juicy white peach. In cardiac phase fragrance Calvin Klein Sheer Beauty Essence harmony notes of peony, magnolia, lilac and luxurious Turkish rose. Easy and charming plume give sexual notes of cedar, vanilla and musk. Spring 2013 Calvin Klein launches new fragrance Sheer Beauty Essence, a new version of the publication in 2012 Sheer Beauty which, in turn, is the original flanker Beauty 2010. The new fragrance inspired by the feminine and graceful confidence. This airy, bright and elegant composition. Vivid and bright top notes include pear Our flowers and juicy white peach. Rich floral heart is composed of lilac, peony, magnolia and Turkish rose. Light airy musk, vanilla and cedar form the basis of flavor.